Hello friends and Happy Thanksgiving! Please be sitting down for this… this year we have decided to eat out on Thanksgiving Day. I know… I know… but my in-laws are in town and they wanted to spend quality time with Mrs. Buddha and me. However, I didn’t want this time of year to pass without cooking some seasonal food and sharing that with you. In addition, leftovers are an important thing to have around the house in order to make sandwiches for a late night snack! There was a beautiful split turkey breast calling my name at the grocery store begging to be smoked on my Big Green Egg. This recipe is simple and the perfect meal if you are hosting a smaller gathering for the holidays. Now sit back, grab a glass of this year’s beaujolais nouveau, and enjoy this post for Smoked Brined Split Turkey Breast. The Pioneer Woman has a great turkey brine recipe that was scaled down for this cook. Fresh orange peel, rosemary, garlic, salt, black peppercorns, brown sugar, and apple cider come together to form this perfect brine. Making the brine is easy: mix the ingredients in a large pot, bring to a boil, turn off the heat, cover, and allow to sit until it cools completely. After the ingredients cool it is time to combine the turkey breast with the brine and let sit in the refrigerator overnight. After the turkey breast sat in the brine all night it was time to set up the Big Green Egg for indirect cooking using a convEGGerator . The temperature was stabilized to 250° using a mix of apple and pecan chunks for the smoke. While the BGE was coming up to temp the turkey breast was removed from the brine and placed in cool water for 15 minutes to remove excess salt. Once the BGE was ready the turkey breast was patted dry and covered in Pork U – TurkeysMatter. I love this seasonal Rub from Pork U as it melds all the flavors of Thanksgiving in to one rub with hints of pecan, garlic, sage, rosemary, and brown sugar. After 1.5 hours the turkey breast measured 140° internally using a Thermapen and it was time to crank the temp up to 300° on the Big Green Egg to get that crispy skin. After 30 minutes at 300° the skin was nice and brown, the internal temp measured 155°, and it was time to take the turkey breast out and let it rest for 10 minutes before slicing and serving. This made for a fantastic dinner and gave us a few slices to use for sandwiches the next day. The turkey meat was so moist and tender thanks to the brine. This recipe for Smoked Brined Split Turkey Breast is the perfect meal to make when having a smaller Thanksgiving meal. 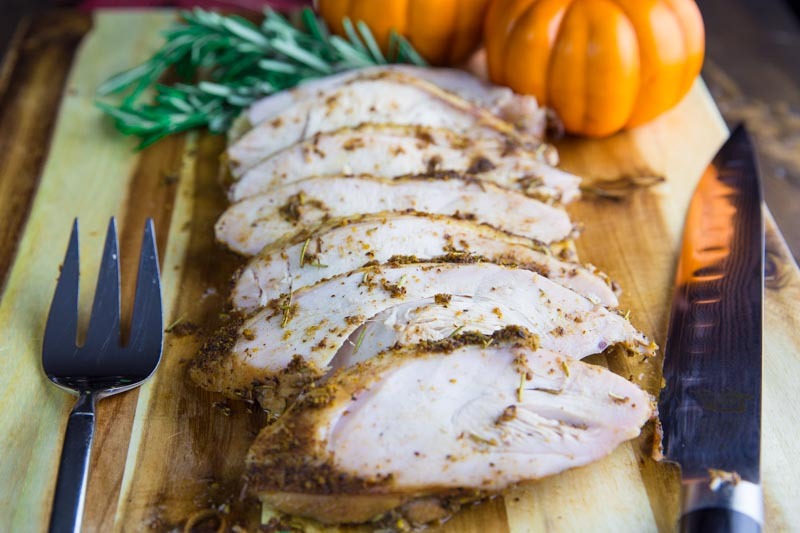 The brine creates a moist turkey breast that is infused with smoke flavor from the low and slow cook.